Mais qu’est-ce donc que cette grande lessive ? Vous trouverez toutes les informations voulues ici. Au lycée Descartes aussi, les élèves ont participé à cette « grande lessive » ! 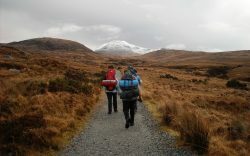 Les photos ont été prises par les participants au voyage scolaire en Irlande (mars 2019) : les 52 élèves en 1e section européenne, les 4 professeurs et le chauffeur du car. Les critiques de l’exposition ont été écrites en anglais par des élèves de la 2e1. I saw an exhibition in the lycée Descartes. There are many pictures hung on 2 strings. They are about the trip in Ireland of the European Section students in year 11. They were accompanied by teachers and stayed there a week. 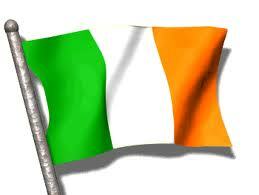 It was Saint Patrick’s Day, an important event in Ireland. 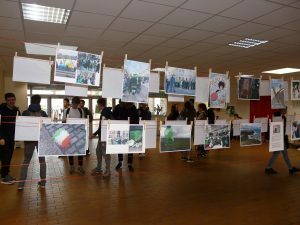 They took many pictures which were exhibited in the school lobby. Some are funny. There are monuments, restaurants, landscapes, or groups taken in pictures. I saw the pictures in the hall of the school. We can see different places and faces. Some pictures are funny and others are beautiful. I like the fact that it’s exhibited in the hall. Everyone can see the exhibition without moving to other rooms or other buildings. We saw it was a very good trip. 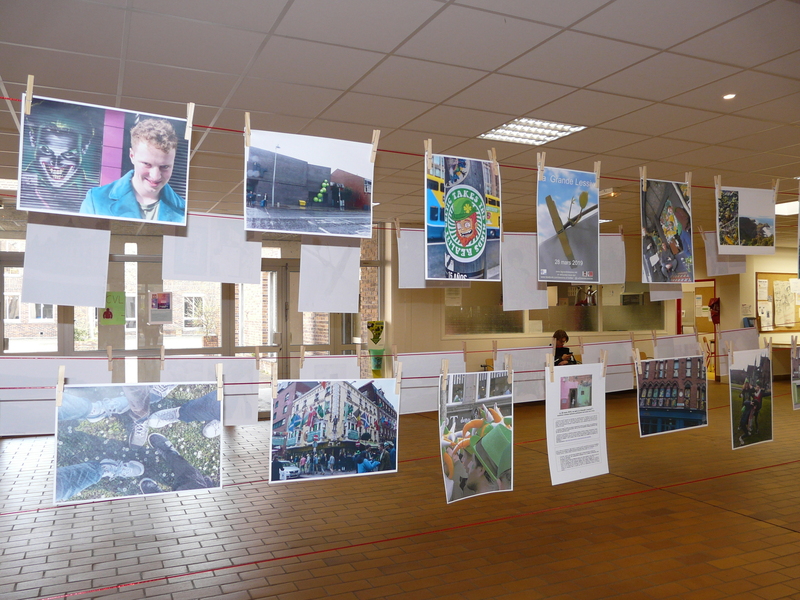 I saw a good exhibition in Descartes High School. We can see many pictures of Ireland. These pictures represent the trip of the students. 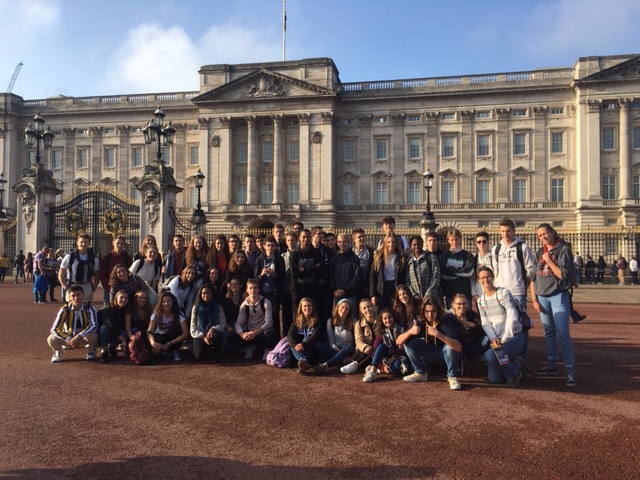 The pictures are varied as we can see the city, the streets, and the students. During this trip, it was Saint Patrick’s Day, consequently everybody was dressed with green so it’s very funny. People are smiling and look happy. Looking at this exhibition, we also want to go to Ireland. This exhibition was so good! It’s very interesting because in the pictures we can see an Irish adventure and when I see these pictures, I feel the emotions of the photographers. So I really like this exhibition and it makes me discover another country without leaving France. Thank you!! For me, this exhibition on Ireland was great and I really liked it. Indeed, it permitted students who hadn’t gone to Ireland to learn more about the others who went there. 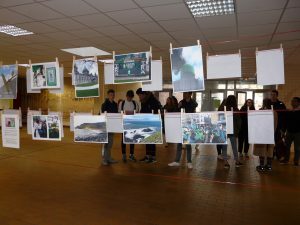 Moreover, I think that was very interesting to make an exhibition in our 6th Form college hall because all the students could see it before going to class. 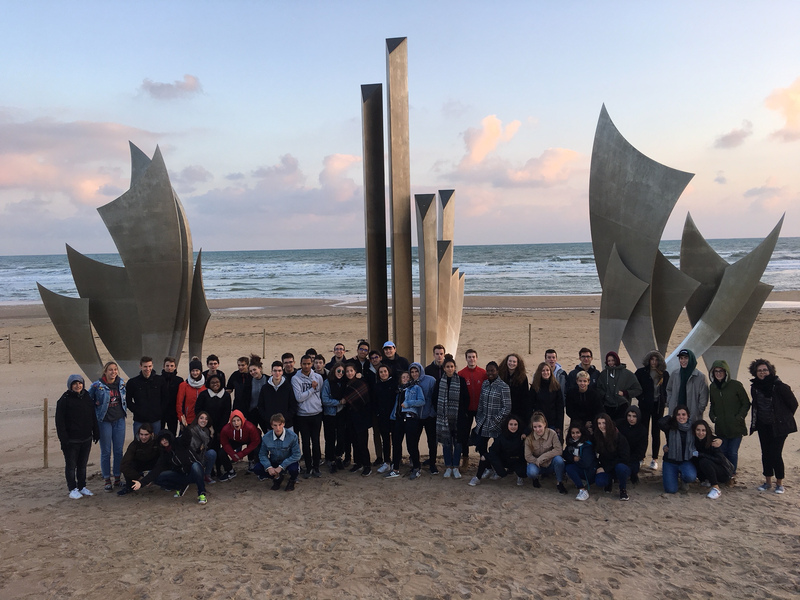 Furthermore in the different photographs, we can see students who are smiling, we can also see beautiful landscapes, so we feel the happiness which the students felt during the trip. I enjoyed the exhibition because it was organized in a way which wasn’t like in other exhibitions. I liked how it was tied with clothes pins. Besides, the pictures with the landscapes were really beautiful. Retrouvez les articles ou interviews rédigés par la classe de section européenne juste après le show ! All in English of course ! On Friday 25th January, we attended a show during nearly 1 hour about London, and more especially about Covent Garden. 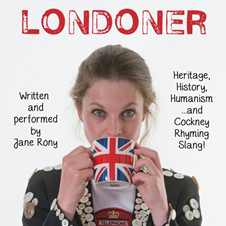 It has been written and performed by Jane Rony. Her character was a costermonger called Pearl. This name is to pay tribute to her great-great-great grandfather who has been elected Pearly King. During the show, Pearl was wonderful because she danced doing tap-dancing, it was very impressive ! She also interacted with the audience and it was interesting. Moreover, we learnt many things about the culture in London with the costermongers, a cockney Rhyming Slang and Covent Garden. 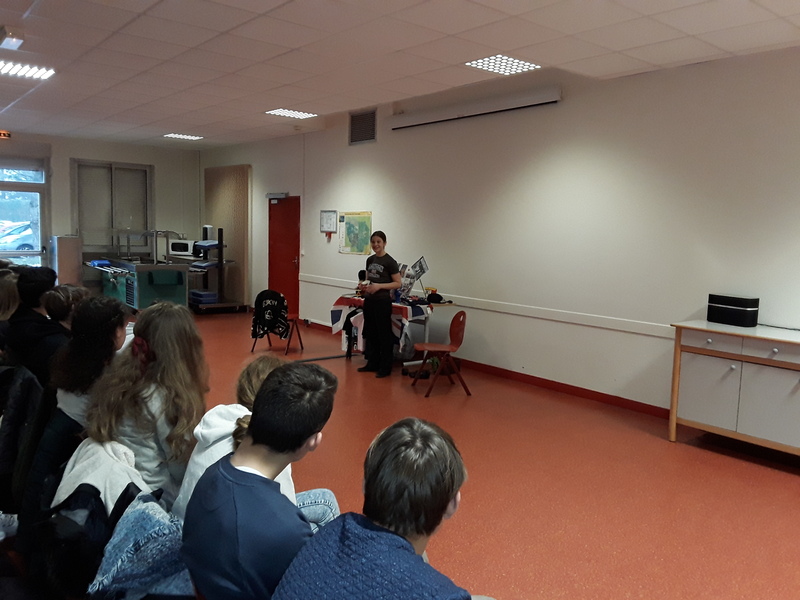 On the 25th January, the actress Jane Rony came to the Lycée Descartes to perform the premiere of a one woman show in front of 222 students. The show’s name is Because I’m a Londoner… and it tells the story of Pearl, a young costermonger, who sells souvenirs in Covent Garden. The class of 2nd5 shared some of their thoughts about it. Most found the show interesting, entertaining and great. It taught them many things about London, about the hidden culture of the pearly king and queens. The actress talked in Cockney rhyming slang with a particular accent, which added a charm but also made it difficult to understand. Moreover, according to the students, she talked too quickly. However, to help them understand, she explained her words with gestures and expressions. She also interacted a lot with the audience. Marie Vilbois, from the 2nd5, prepared a little dialogue with the actress and went on stage. She thinks it was an enriching experience, because she never acted in front of such a public or in English before. To conclude, it was a successful first time for this show ! During the play, we had the chance to discover a little bit more about the job of being an actor. In fact, we believe that the most important quality on stage is the capacity of the actor to put himself /herself in a character and stick to it. He or she has to be loud enough and articulate every word to be understood by all. Usually a big trait of an actor is that they are extrovert and not shy in public. For an actor to be recognized among many he/she has to be at least a little original. For example during this play at some point, she was tap dancing and also singing. She made her own jacket with pearls (like her name) and she was exchanging with the audience. She had a presence and that’s what makes the difference between good acting and great acting. Journalist : Welcome to the set Pearl! How are you? Pearl : I’m great thank you! How about you? Journalist : Fine thanks! So today you’re here to speak about your great-great-great grandfather right? I heard that he was someone absolutely wonderful! Tell us more about him. Pearl : First thank you, that’s really nice from you, I’m sure he would have appreciated it. I’m super proud to be a member of his family. Of course I’m super proud of my job and also to be a Cockney. His name was George Stack and he is the one who is inspiring me every day. Journalist : That’s so cute! Pearl : During his whole life, he fought for the rights of the poor, always against the police. He helped people finding their ways. He was brave, such an example. Journalist : He deserves a lot of respect. And what was his job? Pearl : He was a costermonger and sold some fresh fruit and vegetables, from a basket or a wooden cart in the streets of London. But one thing we should of course remember is that he was elected Pearly King. Journalist : Oh well that’s great! Can you explain us more about this title? Pearl : He found some buttons on the floor in the streets of the city and he sewed them on his jacket. He had a stick and a hat with buttons on it. Journalist : And I heard about Cockney Rhyming Slang. Could you tell us what is that? Pearl : Yeah of course. It consists of a secret language, for communicating between Cockneys. Journalist : What did he like? Pearl : He liked the song “I am a Londoner” and he did tap dancing. Journalist : Thanks for all your answers. It was really interesting. Le blog du voyage en Irlande. 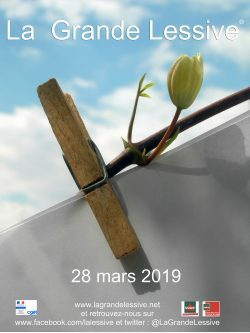 Le 15 mars 2019, les premières euros partent pour voyage pédagogique en Irlande. Retrouvez toutes les informations sur leur BLOG ! Pour la 5ème année consécutive, la Semaine des Arts a lieu du 21 au 25 janvier 2019. Organisée par le FSE et une équipe dynamique de professeurs, son objectif est de faire vivre, à un maximum de personnes, une expérience unique avec le monde artistique. Tous les élèves, tous les professeurs de toutes les matières, tous les personnels peuvent participer à cette aventure. Nous comptons sur vous pour que cette 5ème Semaine des Arts soit une fête ! Un MANGAKA viendra parler de la culture japonaise et des mangas, et proposera des ateliers de création de manga. Les ateliers sont proposés avec des classes, et en accès libre salle 13 si les passionnés veulent s’ajouter à un groupe tout au long de la journée. Brigitte ALIX présentera ses astrolabes, sphères armillaires et autres objets de science. Ce sera aussi l’occasion de voir des « astrodessins », un art très présent en astronomie avant l’avènement de la photographie.Vous la retrouverez dans la hall, en face de la salle des professeurs. 2 journées chorégraphiques avec les danseurs de la compagnie Massala. Ateliers, impromptus ou mises en corps dans les classes. Les enseignants choisissent d’inscrire leur classe pour vivre une expérience inédite dans leur cours. Exposition de travaux d’élèves de seconde 1 et 1L suite à la visite de l’exposition « On the wall » sur Mickael Jackson. Démonstration dansée des élèves d’enseignement d’exploration Danse. Documentaire vidéo sur la renaissance de Harlem et sur les ateliers danse des années précédentes, réalisé par les premières Euro. Spectacle(s) en anglais et ateliers théâtre en anglais pour les élèves ayant assisté au spectacle. Suivez-nous au jour le jour et régalez vous ! Un aperçu de la Semaine des Arts 2017 est là ! 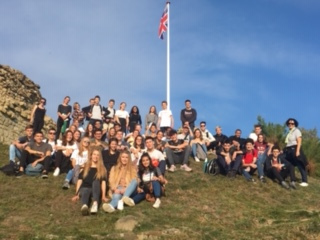 Day 1 : visite de Hastings sous le soleil, en suivant les traces de Guillaume le Conquérant. Les terminales Euro vous envoient un bonjour d’Angleterre ! Puis rencontre avec Winston Churchill dans son War Cabinet. Day 3 : enfin le temps londonien ! Mais cela ne nous a pas empêché d’aller sur les pas de Shakespeare et de visiter l’abbaye de Westminster. 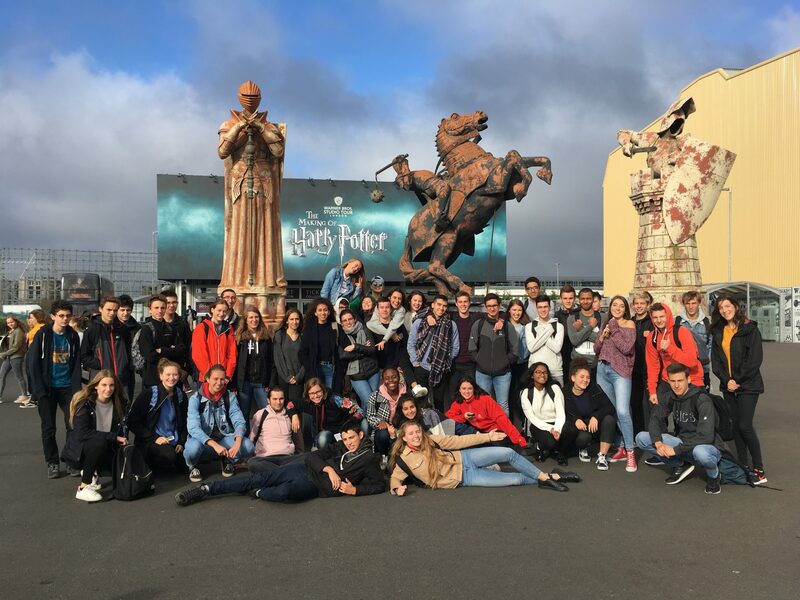 Day 4 : nous voici sur les pas de Harry Potter à la grande surprise des élèves ! Ensuite, visite de Windsor et dîner dans un restaurant typique avant de prendre le ferry. Jour 5 : retour en France … Bonne traversée, nous voilà sur les traces des héros américains en Normandie. 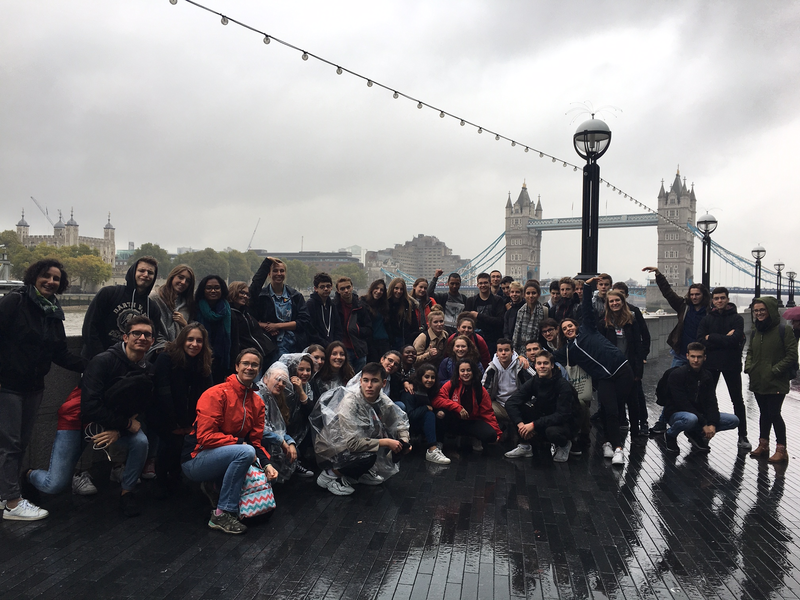 Our students from European section (2nd5) worked last year on the The Great Fire that is estimated to have destroyed the homes of about 70,000 inhabitants in London. It hit the medieval part of The City in September 1666. They edited a web magazine adopting a playful and varied approach. Enjoy ! 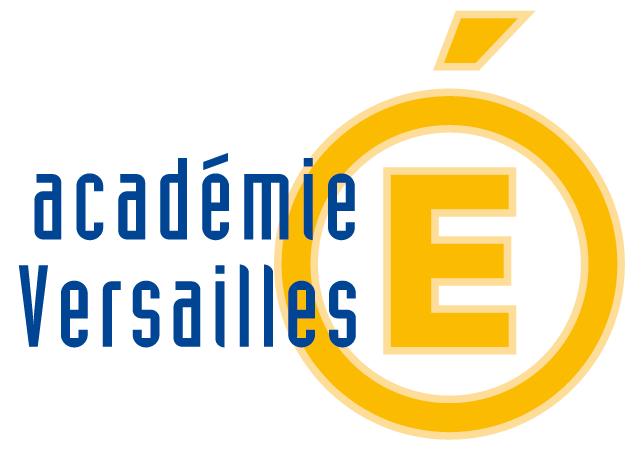 En section Euro au Lycée Descartes (DNL Discipline non-linguistique Histoire-Géographie), les élèves développent leurs compétences linguistiques en anglais et approfondissent leurs connaissances en civilisation des pays anglo-saxons. Le travail prend la forme de projets, souvent collectifs. La promo 2nd5 (2017-2018) vous présente l’un de ses projets de l’année: créer un web magazine sur un événement majeur de l’histoire de Londres – Le Grand Incendie de 1666, qui a ravagé le quartier The City of London en cinq jours et a détruit les habitations de 70 000 londoniens. Adoptant une démarche ludique, collective et variée, les élèves vous font partager ce qu’ils ont appris sur « The Great Fire ». Bonne lecture! Le magazine « DescMagz » est en ligne. Vous pouvez le consulter ici ! 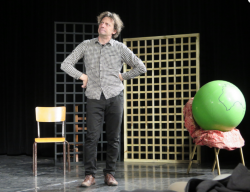 On Friday 19th January, several classes attended the Dario Costa’s one-man show at the lycée Descartes, in Montigny. The comedian presented a mastered and structured creation inspired by four true stories which made us discover the wide land of Australia through the eyes of four men and in chronological order. 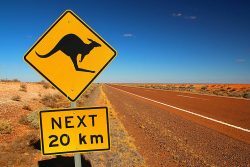 From the first white explorer to have discovered the continent in 1770 – James Cook – to a contemporary road-train driver from Alice Springs who dreams of the 18th expedition in the bush by camel, he overviewed three centuries of immigration in less than an hour. Moreover, the gifted actor managed to captivate his audience since he occupied the entire room space and intertwined recorded music whith live didgeridoo sequences. I was sensitive to his capability to immerse himself into remarkably different characters whith ease and set the scene – miming an ocean crossing or the kangoroos’ tramp. Besides, Darío Costa varied the points of view, telling about the Aborigines’ reactions. I was amused by the blend of the three languages English, French and Italian and moved by the story of the Italian carpenter who ended up happy in Melbourne with his family after years of fighting in the Second World War, emprisonement and efforts in a stone mine. Therefore, I found interesting the anecdote about England’s judiciary system in the 1780s put into light whith satire. To conclude, this show was as entertaining and intelligent as the one I saw two years ago, when Darío Costa embodied both Doctor Jeckyll and Mister Hyde in another play blending theater and humor. Dans le cadre de la Semaine des arts 2018, certains lycéens ont pu assister à un « one man show » intitulé A Journey to Australia. Ecrit et mis en scène par Dario Costa de la Compagnie Drama Ties, et interprété en langue anglaise, ce spectacle mêle humour et faits historiques afin de faire découvrir aux élèves certains moments de l’histoire de ce pays unique. Un groupe d’élèves de seconde a ensuite eu l’opportunité de se mettre dans la peau d’acteurs durant un atelier de technique théâtrale, mené en anglais par le comédien australien. Les élèves de 1ère euro ont ensuite écrit des critiques de la pièce, puis ont voté pour les deux meilleures productions. Les voici! Le Lycée Descartes met en scène sa COP 23 pour poursuivre les réflexions sur le réchauffement climatique. Une équipe d’enseignants du Lycée Descartes de Montigny-le-Bretonneux a organisé sa COP 23 consistant en des simulations de négociations sur le changement climatique avec trois classes de 2nde. Deux classes de 2nde euro (4 et 5), ainsi que la classe de 2nde 3 ont participé à cette conférence. Le projet s’est déroulé sur cette année scolaire regroupant trois enseignantes de Sciences économiques et sociales (Mmes Schenberg, Guerpillon et Bouldoires),deux enseignantes d’anglais (Mmes Bergue et Philippet, deux enseignants d’Histoire-géographie (Mme Lefèvre et M. Tourot) et Mme Mazeau, documentaliste. 106 élèves ont donc travaillé tout au long de l’année scolaire à acquérir des connaissances sur le changement climatique à l’échelle internationale et sur la gouvernance internationale en matière de climat. Par la démarche d’investigation, la construction d’argumentaires et la maîtrise de la prise de parole en public, les lycéens ont approfondi leurs compétences, d’autant plus que l’originalité de cette Conférence a consisté en ce que les lycéens se prêtent véritablement à ce jeu de rôles effectuant les discours d’ouverture et de clôture en anglais. Les présidents et leurs assistants ont également fait connaître à l’ensemble des pays présents (Inde, Maldives, Cuba, Costa Rica, République démocratique du Congo, Qatar, Etats-Unis,Chine et Union européenne) leurs conditions et leurs engagements en anglais. Les négociations et les différentes tractations ont fait intervenir plusieurs lobbies et ONG avec lesquelles des consensus devaient aboutir.Cette mobilisation « s’inscrit pleinement dans le cadre de la grande mobilisation de l’École pour les valeurs de la République« . Nous sommes partis de bon matin, pour récupérer un guide qui nous a emmenés pour ce qui était une surprise pour les élèves : sur certains lieux de tournage de Game of Thrones en Irlande du Nord. Nous avons longé la côte et nous nous sommes arrêtés de temps en temps, jusqu’à la Chaussée des Géants où nous avons eu nos premières gouttes de pluie.